Are you as excited as I am that a new Gooseberry Patch cookbook season is here? It really helps to get me through these winter blues knowing that there are new Gooseberry Patch cookbooks on the way to my house. And, for one of my lucky followers, there's going to be a copy of this cookbook on the way to your doorstep, too. It was nice to find some new breakfast recipes to add a little something special to my usual weekend breakfast routine. I made the Country Ham Biscuits (recipe below) that my husband loved. There were a couple of decadant breakfast dishes such as Baked Shrimp and Grits and Fried Green Tomato Biscuits that appealed to the Southern girl in me. The soup and salad chapter offered up plenty of recipes to use those fresh fruits and vegetables that I'm looking forward to in the spring. But, there are also plenty of soup and stew recipes to enjoy now in the cold of winter. The Family Dinner Favorites chapter offered comforting dishes such as Paprika Chicken and Marvelous Mexican Meatloaf. I made one of my husband's all-time favorite dishes, Shrimp Creole (recipe below), from this chapter. It was a simple recipe and we both enjoyed it. Blue-Ribbon Desserts covers a variety of desserts from fruit crisps and pies to cookies and cakes. And, finally, when you're ready to preserve the bounty of your garden, you'll find plenty of recipes for canning such as Garlic Dill Pickles, Old-Time Corncob Jelly, and Spiced Blueberry Jam. There's even a little bonus page - whimsical Copy & Cut Canning Labels that you can to use to decorate your jars. In all, this cookbook is another winner from Gooseberry Patch. It features a broad array of recipes and I'll know you'll find many that your family will enjoy. Add flour to a bowl. Cut in 1/2 cup butter with a pastry cutter or fork until mixture resembles coarse crumbs. Stir in ham and cheese. Add buttermilk; stir with fork until a moist dough forms. Drop dough by heaping teaspoonfuls onto a lightly greased baking sheet. Bake at 450 degrees for 10 to 13 minutes, until lightly golden. Melt remaining butter and brush over hot biscuits. Makes 2 to 3 dozen. Melt shortening in a large stockpot over medium heat. Whisk in flour; cook until it starts to brown. Add remaining ingredients except cooked rice. Cover and simmer for 20 minutes. Discard bay leaves. Spoon over cooked rice. Serves 4 to 6. Now, here comes the fun part! Would you like to win your very own copy of 101 Farmhouse Favorites? Here are the rules. I would love to win a new cookbook for the new year! I follow your blog through Google Friend Connect and Facebook. I would LOVE to win this book,Gooseberry Patch recipes are some of my favorites! I would love a new cookbook. Would love to win this! I just started collecting these cookbooks this past summer! I love them! This looks like a simply lovely cookbook! Oh, I must try those biscuits! Thank you and I hope you enjoy your Sunday with your family! I would love to win this book! I follow via GFC. I love baking and gooseberry patch. I already have a few of their cookbooks and enjoy them. Love Gooseberry Patch cookbooks and would love to win a free copy of this one. I love GBP and looking to add to my collection. I love your cookbooks and would love to own this one!! Yes a cookbook with comfort food for the new year! I love all of your cookbooks & would be thrilled to win this new one. I often give one of your cookbooks to my daughter & daughter-in-law for gifts & they love them, too. I love your cookbooks! My sisters and I have given them to each other as gifts for years. I would love to win this cookbook! Love Love Love Gooseberry Patch cookbooks! My email is nicolemariesmith@yahoo.com Thanks! Oh, I would simply LOVE, LOVE to win this cookbook! I am salivating right now just looking at those Country Ham biscuits. I love cookbooks and recipes. Recently helped my woman's club publish a cookbook. 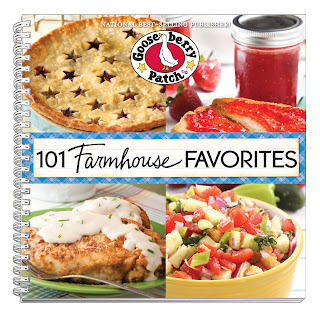 Although I have many Gooseberry Patch Cookbooks, I don't have "101 Farmhouse Favorites" and would love winning it. My mom collected cookbooks, and I have inherited her "sickness"!!! We used to read them like novels!!! These recipes are always so outstanding that I can count on them to be scrumptious!!!! What a wonderful contest!! I would love to win this cookbook!! Huge fan of Gooseberry Patch!!! Would love to win a copy of this great new cookbook!!! Keep up the good work! I love love love all of your cook books and would love to win this one. Please let me know if i have won. Love to collect cookbooks. They each have different things I love to try. I would love to add this one to the collection. I'm a Facebook follower :) Thanks for the chance to win your wonderful cookbook! I only have a couple Gooseberry Patch cookbooks, so this would go great with my collection. Would like to add to my collection of 1. I really enjoy baking and cooking from the one I do have. Gotta have this one !! Love your facebook posts, and would enjoy sharing the dinners made from another great Gooseberry Patch book. It's like the best accreditation there is, when you know it comes from a GP collection. Thanks for your blog and sharing recipes and ideas. Find me in your Facebook friends list, Theresa Meyer. I'll watch my messages to WIN! Happy New Year too! I love cookbooks and have quite a few. My husband and I like to cook together (we are married 31 years and sometimes I think food is the secret to a long marriage). Winning a new cookbook would be so wonderful, as I am always on the lookout for different ones! I'd love to try out this cookbook! I've never used any of the Gooseberry Patch cookbooks, but keep hearing awesome things. Thanks for the chance! Love your site and love Gooseberry Patch. Would love this cookbook. Thanks for chance to win. Looks like another great Gooseberry Patch cookbook! I would love to win it and I thank you for the chance! Well, as an avid cookbook collector, I can't believe I don't own a Gooseberry Patch cookbook. Maybe this drawing can help correct my oversight. Thanks for the Chance. Love Gooseberry Patch cookbooks and would love to win this one! I'm a follower via Facebook. I love these cookbooks and would really enjoy having this one in my collection. Thanks for the offer! I would love to have this one! I need an incentive to get cooking again! I would love to win this book. It would be a nice addition to my collection. I would love to win this cookbook. You can reach me at goddess.tina@gmail.com. Thanks! I love Gooseberry Patch recipes! I would love to win this cookbook. Thank you for the offer! i would super love to win this cookbook!!!!!!!!!! Would love a new cookbook!!! I cannot wait to get my hands on this one! My family is generations deep into loving this kind of comfort food...and winning over those who just don't get it! Great blog! I found you through Gooseberry Patch. I would love to win your cookbook. My email address is christaks@yahoo.com. Thank you! Love the blog and this cookbook looks amazing! Thanks for the opportunity to win! God bless you and your blog and your family! I would love to win a Gooseberry Patch Cookbook, I have a couple and would love to have another. Thanks for the chance to win another cookbook. Would Love to win the the cookbook , I have a birthday coming up .I Love the recipes from Gooseberry Patch and try to get them when they come up on Face book. My family loves them. Love to cook,wpold really enjoy to win a cookbook from Gooseberry Patch. I follow you on Facebook and would love to win this cookbook Gooseberry Patch cookbooks are my favorite ones! I would love to win! I follow on fb. Thank you! I would love to win this cookbook! Gooseberry Patch are my fav!! I love Gooseberry Patch cookbooks - their recipes are AWESOME! I would love to win this cookbook! sandyk54@gmail.com Thank you!! Looks like a great cookbook. We have a local restaurant called The Farmhouse. What wonderful meals we have had there, especially their brunches. Hope this cookbook shares great recipes that will remind me of The Farmhouse Restaurant. I collect cookbooks would love this one! LOVE LOVE LOVE cookbooks! I would love to have this one in my collection! I would love to win this cookbook..YUMMY! Love cookbooks! I have been collecting and using them heavily for years! Much to my surprise one day I woke up and thought about collecting something. I really wanted to collect something. Then it hit me, I already do...I love cooking from my collection of cookbooks.. I love cooking and cookbooks. I woke up one day and thought about how much fun it would be to collect something! Then it hit me, I already collect something..Cookbooks! I love cookbooks! I love Gooseberry Patch cookbooks and would love to add this one to my cookbook collection! We are crazy busy @ our house & I would love to have an idea for every night (I hate thinking of ideas for dinner!) and I love Gooseberry Patch. I am new to your blog & am hooked!